Floyd Mayweather is considered the best pound-for-pound boxer in the fight game. He has a 44-0 record, has won world titles at five weight classes and is the WBC welterweight and WBA junior middleweight champ. A year ago — after he pocketed $85 million for two fights — Forbes named him the world’s top-earning athlete. He’ll likely wear that crown again. His upcoming September megabout with Canelo Alvarez in Las Vegas sold out in less than 24 hours and already topped boxing’s all-time live gate with nearly $19 million in sales. Pay-per-view earnings and all the rest is still to come. Yet, according to this account out of Vegas, it turns out Mayweather does have a loss on his record. The story involves Chris Pearson, the unbeaten Trotwood middleweight who got the TKO, not in the boxing ring, but on the basketball court. 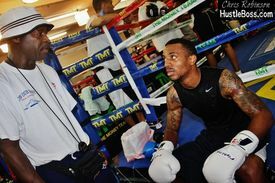 As Pearson was preparing for his Las Vegas debut as a pro tonight — his six-round undercard bout with Arturo Crespin is part of a Mayweather Promotions offering whose co-main events will be broadcast live on Showtime — a colorful story has surfaced about the night he and Floyd faced off. After a stellar 93-8 amateur career, Pearson turned pro late in 2011 and soon found himself based mostly in California. Eventually he began training in Vegas, as well, and that’s where he met Mayweather, who had been one of his fistic heroes as a kid. “The first few days my coach, Al Mitchell, wasn’t there yet, so I just worked in the gym by myself,” Pearson said. “I saw Floyd there, but I didn’t say anything. “Well, Chris said, ‘Look, the best thing for you to do is try to get me in the ring, ‘cause you can’t touch me on the court.’ They laughed that off and Chris forgot about it, but that night about 2 a.m., Floyd calls him and says he’ll send somebody over to pick him up. They were all going to play basketball at the 24 Hour Fitness gym. So did Chris, who played four years of basketball at Trotwood-Madison High School, really school Floyd? As he recounted his version of the story by phone from Vegas, Chris was a bit more subdued: “Floyd’s an athlete and likes the sport, so he’s not bad. But I’m a little more accomplished. I really played basketball. I’m legit. “But truthfully, all that means nothing. What counts is that basketball gave us a chance to meet each other and share something we liked, and from that Floyd and I sat and talked about a lot of things. He’s totally different than the guy you see before a fight at a press conference. He is an outstanding guy. “And this has nothing to do with his status or him being bookoo rich or any of that. He took to my personality and I took to his. We laugh and argue about sports and we talk about serious things, too. He’s like that with some of the other young guys, too. He’s adamant about giving us knowledge about the game to help us avoid the negative things he went through. And he may soon be a business partner. Although Pearson has a managerial contract with Al Haymon, he never signed with any one promoter. Oscar De La Hoya’s Golden Boy Promotions has put on most of his first seven pro fights, all of which he won, but Mayweather has him under his promotional banner tonight. But then he was denied a Nevada boxing license. The problem? He couldn’t pass the eye exam. “He had basically the same thing that Sugar Ray Leonard had, but with Chris they caught it early,” Milt said. “At the back of his eye there were three tiny holes. A lot of near-sighted people have that, but if you’re not fighting, it’s not a problem. At first Pearson admits he struggled both physically and mentally with the setback: “When I first came back I wasn’t quite ready and it took a while for my eyes to adjust. And it was hard watching my peers advance while my fights kept getting canceled. Over the past couple of months he’s worked as a sparring partner in Big Bear Lake, Calif., for WBO middleweight champ Zaurbek Baysangurov and then moved his own operation back to Las Vegas. This week he’s been spending time with Chris Wright, the fellow Trotwood basketball player who starred at the University of Dayton, played briefly with Golden State and now is playing with the Toronto team in the NBA summer league in Las Vegas. Pearson has gone to a couple of those games and Wright will be ringside tonight. After this, Pearson hopes to fight again in August or, better yet, on the Mayweather-Alvarez undercard Sept. 14 at the MGM Grand. Mayweather seems to think so, too. And that would include a cross-over dribble and an ability to drain the 3.